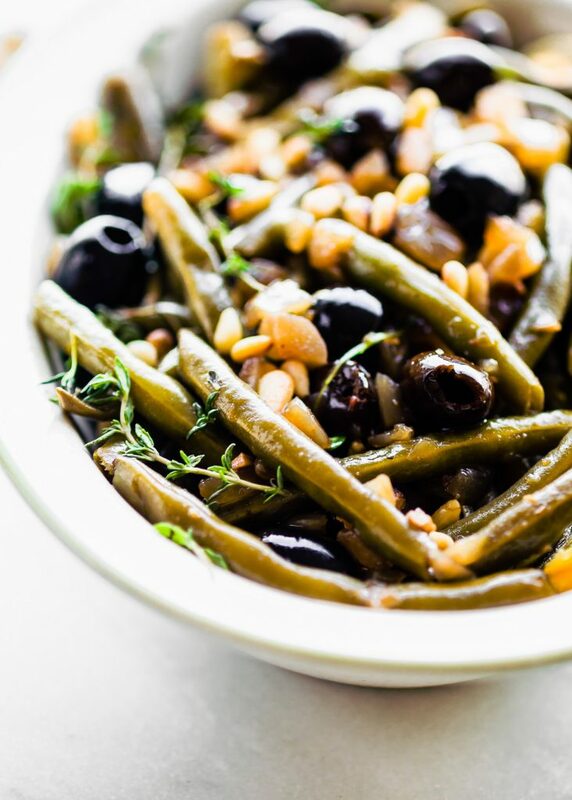 Balsamic Olive-Oil Braised Green Beans are a quick, easy, and healthy side dish. 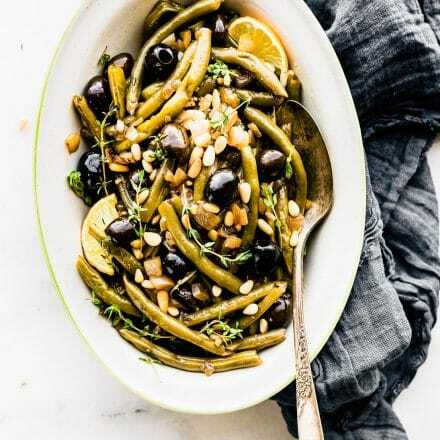 For this braised green beans recipe, fresh green beans are seasoned with thyme, then braised with balsamic vinegar, olive-oil, onion, black olives, and topped with toasted pine nuts. 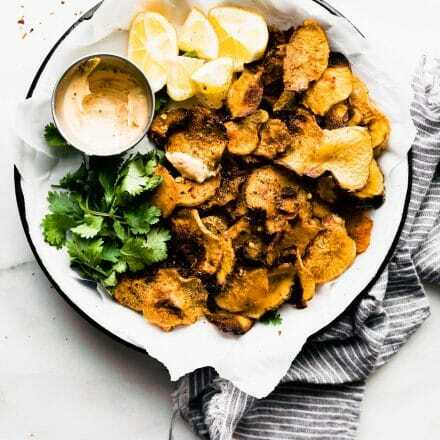 Paleo, whole 30, low carb, and vegan friendly. Oh hi there! 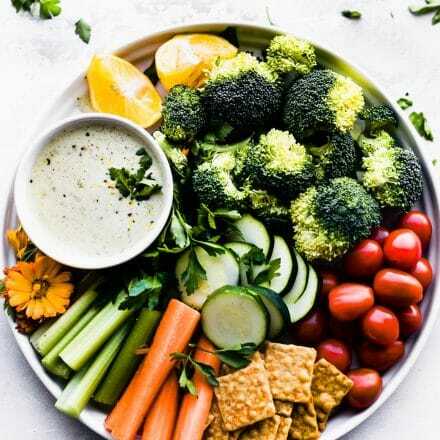 Let me throw some veggies in your inbox. A large plate of braised greens beans to get you inspired for Holidays. That’s cool, right? Sigh…Holidays. Excuse me as I pout a bit about the Holidays. You see, we just left Colorado. We spent a long weekend with family and I’m already missing those three blissful days . We won’t get to see family until after Christmas, so this little getaway was needed! Lots of hiking, eating good food, trying new cocktails, and enjoying good old catch-up time. I only wish we could’ve stayed longer. Hence the sigh. But yes, the holidays must go on. Side note, I can’t wait to tell you all the things we did in Steamboat Springs, just on another day. It involved a being SUPER close to moose and a bear. How’s that for leaving you hanging? Ha! Okay Okay, no more focusing on the past, let’s talk about the future. And now that we have had Canada Thanksgiving come and go (can’t leave out Canadians, eh? ), I thought I would go ahead and prep some ideas for American Thanksgiving. Mmmm k? 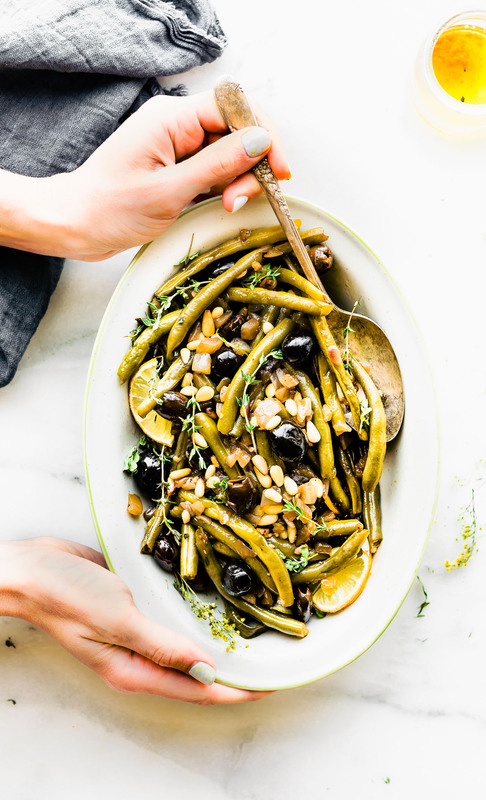 This balsamic braised green beans dish is inspired by my mother. Last weekend we chatted away about some of our family favorite recipes; some traditional fruit bake recipes and some new recipes that would be fun to try. I was telling her about how I wanted to try new cooking methods, different spices etc. etc. You know the typical mom and daughter talk. Nerdy foodie cooks in the kitchen. But that’s the great thing about my mother, while she adores tradition, she is also open to trying new dishes. I, on the other hand, always look for ways to change things up. So you can see where I’m going with this yes? Green beans…. shall we braise, bake, roast with other veggies, or sauté? What’s your method for this traditional holiday side dish? I think you should try my method, braising vegetables. I may be bias. But hey, it’s my NEW favorite old cooking method. If that makes sense? Have you ever braised vegetables? If you haven’t, your life will be changed. Braised vegetables can be just as flavorful as braised meats, and just as tender, yet usually cook in a half the time. Braising the vegetables also helps develop a rich flavor; one that tastes amazing and is so aromatic.. TRUST ME, it is GOOD! 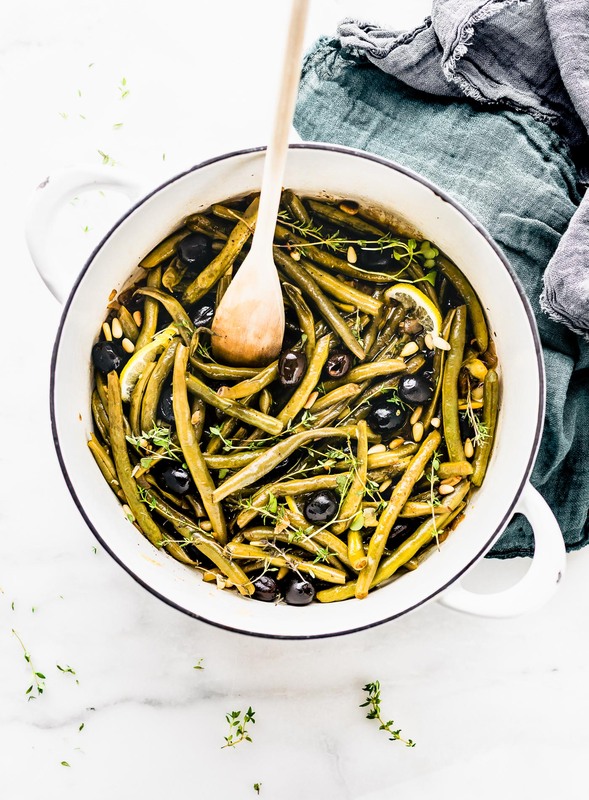 I braised these green beans, in similar way you would braise the popular Lebanese Mezze dish called loubieh bil zeit, which means “green beans in oil.” Except I added balsamic vinegar, onion, olives, and herbs to infuse the olive oil. Then topped it off with toasted pine nuts. It’s a little bit of Mediterranean meets American. And as you all know, I adore Mediterranean! This is a simple dish to make all in one pot. Just throw in a few flavorful ingredients and let it slow cook for 30 minutes. So you see, these braised greens beans is new way to make that traditional holiday side dish. I’m diggin it. Now to convince my mom. Kidding, she will love it! Someone to share it with. Cause it’s TRADITION! Mwah! 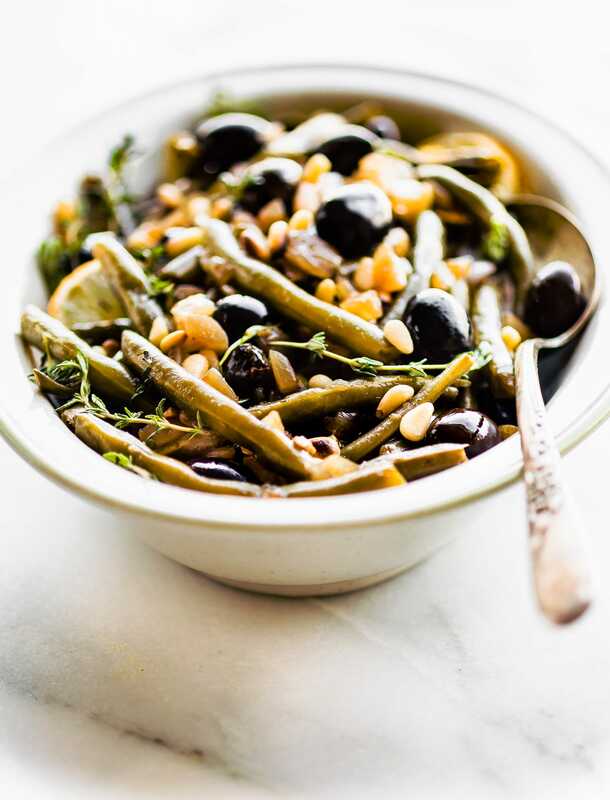 For this braised green beans recipe, fresh green beans are seasoned with thyme, then braised with balsamic vinegar, olive-oil, onion, black olives, and topped with toasted pine nuts. Paleo, whole 30, low carb, and vegan friendly. Heat olive oil in a large dutch pot or large saucepan over medium-high. Add garlic and onion and cook until tender, close to 4–6 minutes. Place the olives and 1/2 c water in the pot with the garlic/onion. Cook for 5 minutes on medium high until olives begin to soften. Add your green beans, kosher salt, pepper, balsamic vinegar, and 1/2 cup more of purified water. Cover and reduce heat to medium until green beans are tender. Check around 18-22 minutes. While green beans are cooking, toast your pine nuts. You can do this in toaster oven or regular oven. Simply place nuts on foil and in oven at 400F for just a few minutes, until golden brown. If you are using toaster oven, they will brown fast. Be careful not to burn. Once beans are cooked, place them in serving dish or keep in pot. If placing in a serving dish, add about 1/2 cup of the sauce from the dish, plus your olives. Garnish with fresh thyme, orange slices, and toasted pine nuts before serving. To braise vegetables or not. That is the question. Hit me up with more braised vegetable or green bean recipes if you got them. Capeesh? These green beans will be the perfect addition to our Thanksgiving table Lindsay! I love your combination of ingredients here. I caught your IG story with the bear!! YIKES! Vegas would LOVE this! She loves her some green beans, and is basically an olive whore. Also, I think we should hang out and bring our moms. It sounds like we’d all be BFFs… and be super well-fed. This would be a perfect side dish for the holidays! These sound so delicious!! I could eat the whole bowl myself! I love amping up traditional dishes into something new. I hear ya on being far away from the family. I didn’t see mine during the holidays last year which was especially hard just coming out of a major surgery. It’s hard being far away, but we make the best of it and send our love through good food! I am loving the idea of eating these green beans on Thanksgiving instead of that icky casserole. I’m just not a fan of that! Loving your new photos! Green beans are my fave! Wow, this recipe looks great! I quite enjoy a green bean . . .or plate full. 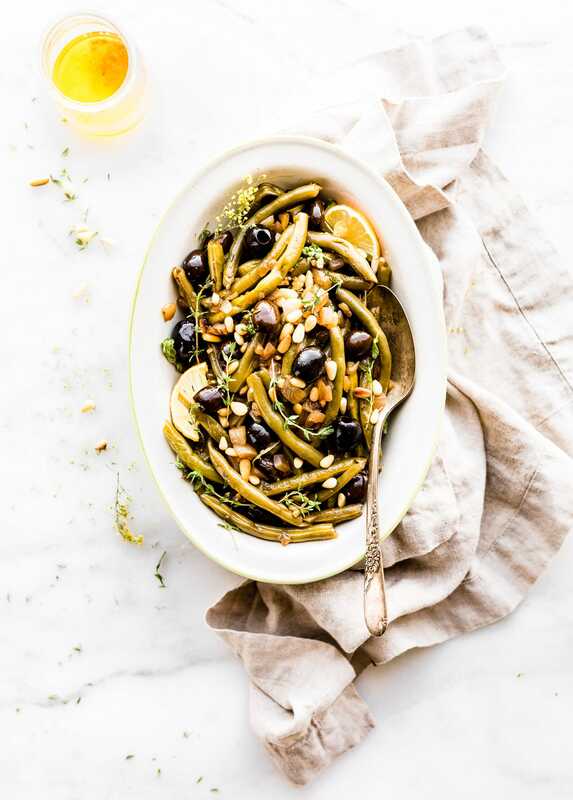 Would have never thought to do olives and balsamic — you’re so creative! I’ll serve you a plate full any day! 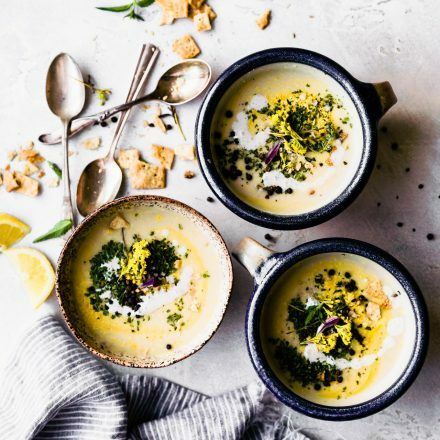 Looks delish…love the combo of textures and flavors AND it’s pretty. DO have a question, what kind of black olives? I just used whole black olives. But you could use marinated if you want even more flavor. Does that make sense? Wow, looking really reallllly good! 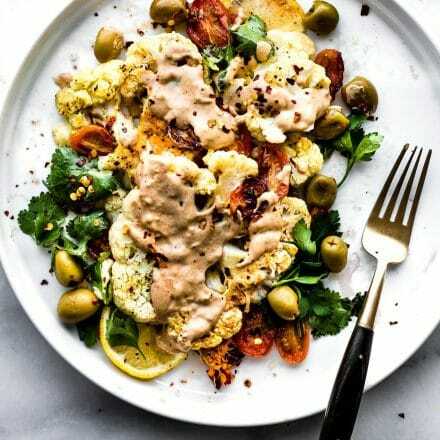 I love Mediterranean flavors and YOU! Also, I am so green beaned out because of the CSA and the twenty pounds in my fridge and yet, I want to try this recipe. 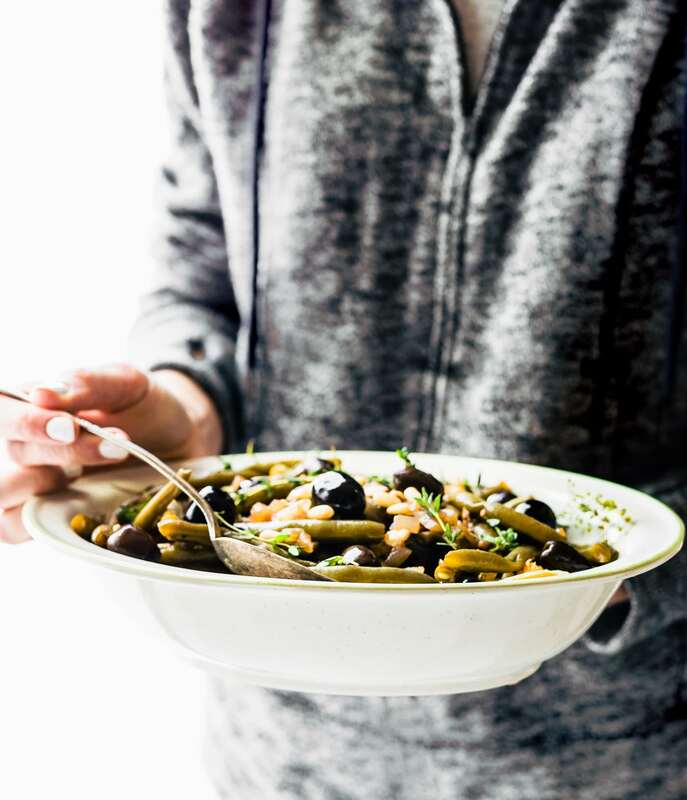 I love the idea of braising the veggies and the addition of olives and pine nuts: sheer genius. Dammit, why don’t you live next door? This is a travesty. These green beans looks so delicious!! Great for Thanksgiving too! 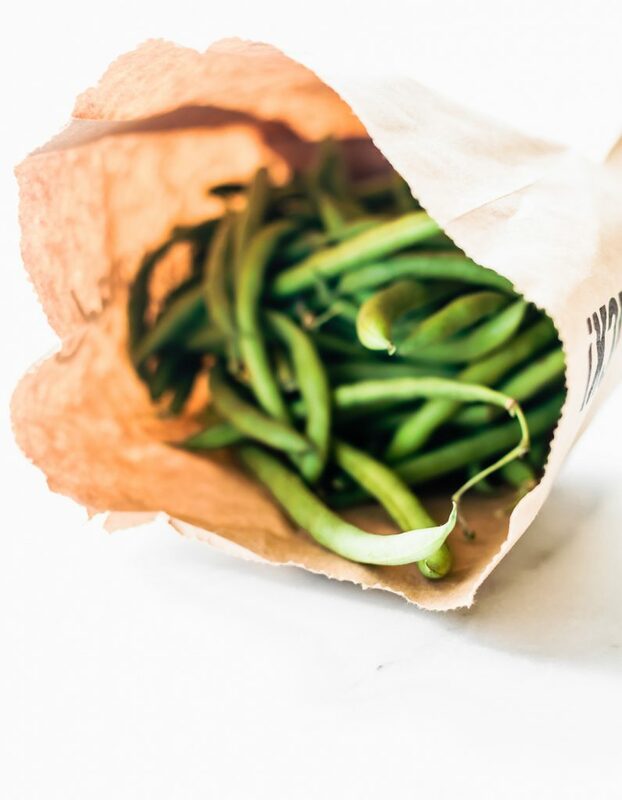 Green beans aren’t just for the fall–I eat them all the time! They are so delicious and nutritious! You can’t beat that!